This year, ACONEXT once again presented itself, together with the elite of IT suppliers, as an exhibitor at the 12th Daimler EDM CAE Forum. Having selected “Communicate. Cooperate. Inspire” as this year’s motto, the exhibition offered the 6,000 visitors a great diversity of topics, with a large number of contributions and interactive workshops. The relevance and the possibilities of optimal supplier integration were analysed in several interaction scenarios. For example, the model of an articulated shaft offered an impressive presentation of the core competences of system engineering in the areas of geometric design, kinematics, CAE and tolerance management. In partnership with T-Systems, ACONEXT also presented a cross-booth and cross-company interaction on the subject of Predicted Engineering with IoT/Big Data of test data. 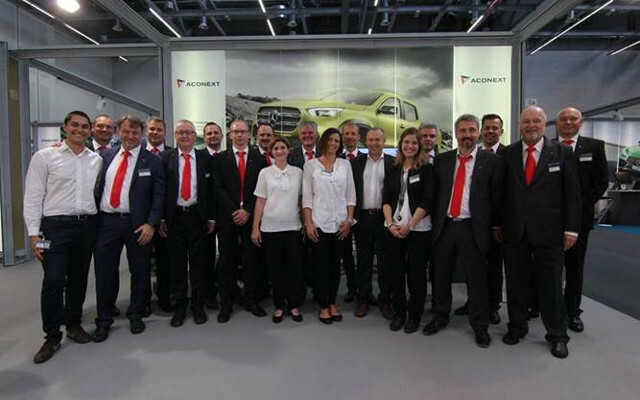 The announcement of the partnership with Daimler Protics GmbH was another highlight of the ACONEXT presentation. The lecture by our experts Dr. Guido Vielsack and Jochen Voigtmann on “supplier integration using a 3-D master method for the entire process chain” was very well attended. During their presentation, the two speakers gave exciting insights into the digitalisation of the development process chain and met with lively interest in the plenum. We would like to thank Daimler AG for the opportunity to make our contribution to this trend-setting event. We also thank all attendees and all the visitors to our booths – we are looking forward to the next occasion for discussing the future of digitalisation with you.